RIO AMAZON Cat`s Claw Loose Tea or ‘Uña de gato’ is a climbing vine that is native to the Peruvian Amazon and gains its name from the barbed ‘claws’ with which it climbs the jungle canopy. Cat’s Claw has been used by rainforest tribes to contribute to the immune system and may help to maintain flexible joints and it is still well known for these benefits today. 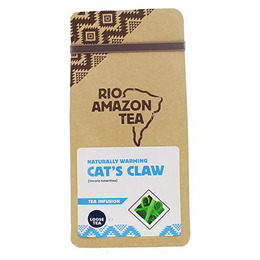 Rio Amazon Cat`s Claw, is also available in 40 Teabags and 90 Teabags. Also known as `Uña de gato`. Helps to maintain flexible joints. Contributes to the immune system. Put 3 heaped teaspoons (5g) of cat`s claw into a saucepan with 3 cups (600ml) of cold water. Bring to the boil and simmer for 10 minutes. Strain and serve. Add sugar or honey as desired. Drink 3 cups per day or as recommended by your health practitioner. Below are reviews of RIO AMAZON Cats Claw Loose Tea - 200g Powder by bodykind customers. If you have tried this product we'd love to hear what you think so please leave a review. RIO AMAZON Cat`s Claw Loose Tea has been used by rainforest tribes to contribute to the immune system and may help to maintain flexible joints and it is still well known for these benefits today.